Twister Tweed™ embroidery thread is one of the newest innovations from Robison-Anton. Instead of the traditional variegated embroidery thread, where a single strand changes from one color to another, Twister Tweed thread is two different colored strands, twisted together to form a dual color embroidery thread. This gives a more "3-D" effect to your embroidery designs. Each spool contains 700 yards of 40-weight rayon embroidery thread. See our Twister Tweed Package which includes all 21 colors shown here plus a FREE wooden display rack, offered at considerable savings over the per-spool price. Colleen Lyall has created several designs which feature Twister Tweed thread. One of the nicest is "Sunshine", shown to the right. 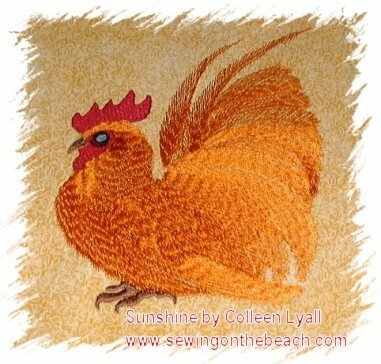 Colleen says: "The entire rooster was done in Robison-Anton Mandarin Yellow Rayon Twister (#79062). The sheen of the rayon, the density and the length and direction of the stitches is how I accomplish the depth of color and subtle changes." Wow! Who knew you could do all that with one thread!